Receive announcements of dyncall releases, critical bug-fixes and porting news by subscribing to the dyncall-news mailing list. The dyncall library encapsulates architecture-, OS- and compiler-specific function call semantics in a virtual bind argument parameters from left to right and then call interface allowing programmers to call C functions in a completely dynamic manner. In other words, instead of calling a function directly, the dyncall library provides a mechanism to push the function parameters manually and to issue the call afterwards. This means, that a program can determine at runtime what function to call, and what parameters to pass to it. The library is written in C and assembly and provides a very simple C interface to program against. The library comes in very handy to power flexible message systems, dynamic function call dispatch mechanisms, closure implementations, to bridge different programming languages, or to simply wrap a "vararg" function. When it comes to language bindings, the dyncall library provides a clean and portable C interface to dynamically issue calls to foreign code using small call kernels written in assembly. Instead of providing code for every bridged function call, which unnecessarily results in code bloat, only a couple of instructions are used to invoke every possible call. dcArgDouble(vm, 5.2); // Push/bind argument(s). r = dcCallDouble(vm, (DCpointer)&sqrt); // Call. Note that, by exposing this functionality to a dynamic scripting environment, the latter can gain system programming status to a certain degree. It is easy to see the power one can get by calling a C function directly from within a scripting language. Demonstrative bindings and examples for several different scripting languages are provided with the library. The dyncall library runs on many different platforms and operating systems (including Windows, Linux, OpenBSD, FreeBSD, MacOS X, DragonFlyBSD, NetBSD, Plan9, iOS, Haiku, Nintendo DS, Playstation Portable, Solaris, Minix, Raspberry Pi, ReactOS, etc.) and processors (x86, x64, arm (arm & thumb mode), arm64, mips, mips64, ppc32, ppc64, sparc, sparc64, etc.). Most of the platforms' C-calling conventions are supported - including "vararg" functions, as well es C++-"thiscalls" (on some platforms), syscalls (on some platforms), and the multitude of calling conventions on Windows ("fastcall", "stdcall", etc.) or some embedded platforms (e.g. atpcs, eabi, apple, armhf on arm, ...). Most of C99's types are supported for setting up a call, however, structure and union support is still missing (we are working on it, though). Additionally, dyncall comes with dyncallback, a library for callback support, and dynload, to facilitate portable dynamic library symbol loading and access (only for platforms with dynamic library support). The feature matrix below gives a brief overview of the currently supported platforms (as of the repo's tip). 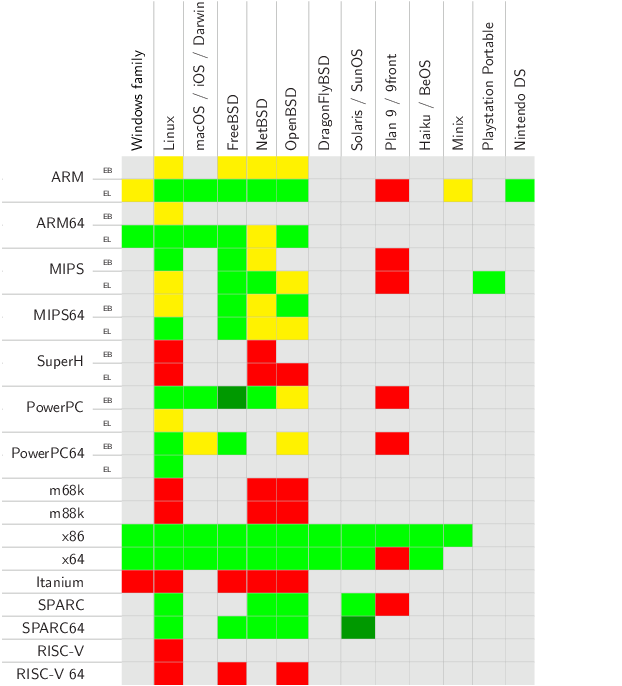 Different colors are used, where a green or light green cell indicates a supported platform, yellow a platform that might work (but is untested) and red a platform that is currently unsupported. Gray cells are combinations that don't exist at the time of writing, or that are not taken into account. Dark green cells mark a supported platform, however, dyncallback support is untested. Please note that a green or light-green cell doesn't imply that all existing calling conventions/features/build tools are supported on that platform (but the most important). For details, refer to the dyncall manual/documentation. For information about how we test and build a majority of the supported platforms, check out dynOS.